Does Drinking Coffee Help with Diabetes? You are here: Home / Foods / Does Drinking Coffee Help with Diabetes? Do you feel you need that cup of coffee in the morning to get yourself fully awake? Do you find you need that cup of coffee to keep going later on during the day? These are two different sets of “needs” and may reflect different “issues”. Coffee—made from the (usually) roasted beans of the coffee plant (Coffea, arabica, Coffea canephora and other species)—is probably originally from Ethiopia, though today, coffee is grown in many countries, generally in equatorial regions, between the Tropic of Capricorn and the Tropic of Cancer. It is very likely that the Ethiopians have been enjoying coffee for hundreds if not thousands of years. Today, coffee is one of the most commonly consumed beverages in the world. The known history of coffee starts in the 15th century in Arabia and was used by the Sufis to stay awake for religious rituals. The use of coffee as a stimulant spread throughout the Middle East and Northern Africa and was known in India by the 17th century. By that time, coffee was also gaining popularity in Europe and was given the title of a “Christian Drink” by Pope Clement VII in 1600. Coffee houses became popular later in the 17th century with some of the same coffee houses surviving and popular to this day! By the 18th century, coffee plantations were being established in the Caribbean and in South America, particularly in Brazil, where today, coffee is a major export. Everyone thinks of caffeine as one of the major coffee constituents, and it definitely is. Chemically, caffeine is a xanthine and related to theophylline (found in teas) and theobromine (found in chocolate). However, coffee also contains a number of other phytochemicals (the various chemicals found in plants) including chlorogenic acid, oxalic acid, polyphenols—many of which act as antioxidants—and diterpenes such as dafestol and kahweol. In addition, when the same coffee made in the same coffee shop was measured on 6 consecutive days, the amount of caffeine (in 16 ounces) ranged from 299.5mg to 564.4 mg!1 Espresso generally has the highest levels of caffeine. In general, the darker the roast, the more caffeine in the final coffee. Also in general, using a French press or a similar method will extract more caffeine from darker roasts, while percolator or drip methods will extract more from lighter roasts. Coffee also contains no sugars or carbohydrates and has insignificant amounts of vitamins except for riboflavin and niacin. Coffee does contain minerals such as calcium, magnesium, potassium, phosphorus and some sodium. In brewed coffee, the amount of magnesium may be significant. Coffee beans contain fats but a good deal of these are commonly lost in the roasting and brewing process. All coffee is brewed from (usually) roasted coffee beans. You can get drip coffee, use a French press or use percolated coffee. For the most part, you can assume the amount of caffeine per 8ounce cup is roughly 100 mg. However, there are many different ways of preparing coffee beyond the method of brewing. Some of the studies regarding coffee and diabetes have been contradictory—the best way around this is to look at systematic reviews or a meta-analysis. These approaches tend to minimize the differences and find the “common grounds” (pun intended). One such systematic review found that the risk of T2D was reduced by about 35% in those that drank at least 6 cups of coffee a day and about 28% lower in those that drank 4-6 cups a day. In another meta-analysis, one with 41,934 men and the other with 84,276 women, men who drank at least 6 cups of coffee a day had a 54% lower risk of developing T2D while women who drank at least 6 cups of coffee had a 29% lower risk of developing T2D. Drinking decaffeinated coffee also lowered the risk of T2D, but not as much. One set of results that is not yet explained is that in another study, decaffeinated coffee lowered the risk of T2D in postmenopausal women while regular caffeinated coffee did not lower the risk. 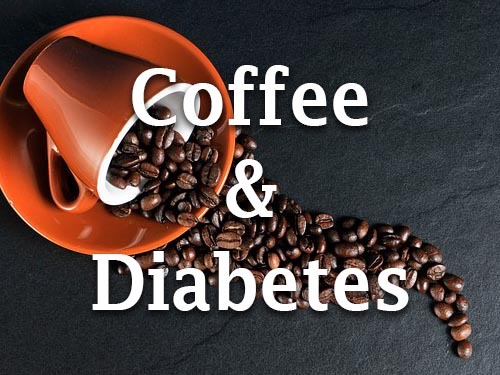 At this point however, since short-term studies of coffee and diabetes indicates that coffee can lower insulin sensitivity and will increase blood sugar, coffee is not recommended to prevent diabetes. The most recent follow up of a large study again indicated that coffee consumption can protect against T2D. These authors also suggested that anti-inflammatory effects of long-term coffee ingestion may be important benefit to those diagnosed with diabetes. Overall, while they did not recommend coffee for those with diabetes (they took the common approach of suggesting that more studies are needed), these authors suggested that the overall benefit of moderate coffee intake (~4-6 cups a day) may outweigh any potential downside. The best way to approach coffee intake is to keep track of YOUR blood sugar levels and see what happens after drinking coffee. If you see no significant changes, coffee may work well for you, but if you see significant increases in your blood sugar, you might first try decaffeinated coffee, though other than for post-menopausal women, there doesn’t seem to be any difference, or try it black, with low-fat milk, with coconut or soy milk. What it may all “boil down to” is that the response to coffee may be an individual one, and you may have to experiment a bit to find the best answer for you. For many, the best choice (or compromise) is often 2-4 cups of coffee a day. Talk to your health care team and see what might work best for you. van Dam RM, Hu FB. Coffee consumption and risk of type 2 diabetes: a systematic review. JAMA. 2005;294(1):97-104 . Diabetes and Butter: Is Butter Good for Diabetes? Are Eggs Good or Bad for Diabetes? TheDiabetesCouncil Team consists of certified diabetes educators and registered nurses that compile and research a given topic and publish it as a team. Each team member has at least 15 years of experience in diabetes care and management.